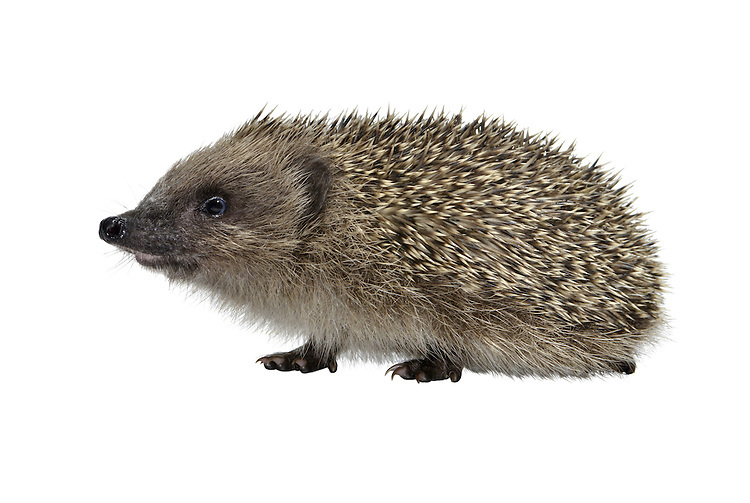 Hedgehog Erinaceus europaeus Length 23-27cm Mainly nocturnal animal, protected by spines (modified hairs). Feeds mainly on invertebrates but will take food put out by people. Hibernates from Oct-Apr. Spines are erectile and an effective deterrent when animal rolls into a defensive ball. Head and underparts are covered in coarse hairs. Muzzle-shaped head ends in a sensitive nose. Utters a pig-like squeal in distress, and grunts when courting. Familiar garden resident.